Since there are lots of ways to make money through internet which graduate and undergraduate students can implement in order to make some extra money at their spare time. Here we do not going in details of jobs that can be done, but will discuss in-depth about blogging which is chosen as a good job for students by many professionals and analysts. Now, there would be different or may be mutual thoughts in case of each of them who prefer blogging as a home-based job for college students, and I am one of them having the same characteristic. Throughout this post, I will be discussing why a student should start blogging to earn cash in their spare time and the benefits for them in current time as well as in future. Doing part-time jobs on internet will surely bring money in their pockets but they are of different types, if someone suggest blogging as an online job to do at your spare time, one benefit is quite definite that it will make money (even hefty amount). But there are some other reasons that I would say when I prefer blogging for a college student and let someone asked me WHY? Being a blogger, you will need to publish informative blog posts on your blog for which you will have to read other blog posts to generate ideas for composing new blog posts. On one hand, you will write your post to publish while on the other hand, since you will have to read several blog posts written by different authors so you will also notice the way they wrote and implementing the positive things, you will be improving your writing skills. Through their friends blogs & websites: Since they will have many friends founded in blogosphere so whenever he or she get known of his/her blog, they will read it and for sure if they read, there will be something new and important for them. From Social Media: To become a successful in blogging, you will need to be present in social media in order to engage audience with your site and find new visitors to read your blog, but your presence on social media will also let you get notified by other’s blog posts, so if you found any new and interested topic, you will surely like to read the full post to get the information. If they did blogging in at their right way and built their blog successively, the field of blogging will get increased and will get more and more projects/jobs to work on. This isn’t understandable to the newbies but I would like to continue that after keyword research, you will generate ideas to get projects continuously, as well as there are lots of people who hires freelancer for their projects. In short blogging is also a best way to make a road to a successful career in the future. This is quite definite that students have time to experiment, they don’t lose heart soon when fails experimenting things, unlike the elders, they don’t disappointing at first attempt as well as don’t lose their temper. And that’s one of the main reasons at a psychological point of view. It is actually possible that your strategy may fail even several times in blogging so that’s why you need to be trusted on your own hands. And students are the persons who have the courage to face it, as well as work continuously to get success. 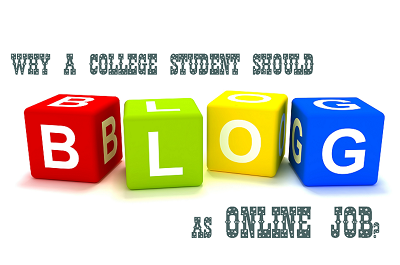 This isn’t the end of benefits of choosing blogging as an online job for a college students but looking at the article length I have to break here for now, and I also know about you people that’s why the rest are for you to come In the comment section and let us know what do you think why a college student should start blogging if he/she looks to be an online worker? Basheer Ahmad is a blogger and he loves to explore and share online jobs for college students to earn some good amount of money at spare time. You can connect with him of Facebook or Google+. thanks for getting and understanding the message on this post.